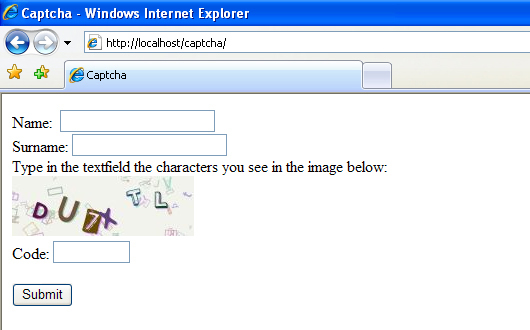 This class generates a CAPTCHA validation images to embed in forms. - Display an optional refresh link to generate a new picture with a different key using AJAX. Generating a new text this way does not count to the user attempts limit verification. This class generates a CAPTCHA (Completely Automated Public Turing to tell Computers from Humans Apart) image to embed in forms and validate them. After the test form is submitted a key entered by the user in a text field is compared by the class to determine whether it matches the text in the picture or not. The class is based in the code of hn_captcha released also in this site by Horst Nogajski with the name hn_captcha. - Messages for different languages are easier to change. It uses language files instead of changing code. To run the example just place some ttf fonts in the captcha/fonts folder and it will work straight ahead. "DEBUG_ENABLED"				bool: If true then debugging is enabled. "CAPTCHA_PATH"				string: Absolute or relative path to where the images will be saved. (Must be writable and must be in the same published web-tree as the script). "CAPTCHA_PREFIX"			string: Prefix to be used for the image filenames. "CAPTCHA_CLASS"				string: CSS class name for the displayed HTML tags. "FONT_PATH"				string: Absolute or relative path to where the fonts collection is. "FONT_COLLECTION"			mixed[array(strings)|string]: The font or array of fonts to be used. AUTO takes all fonts in FONT_PATH. "CHAR_NUMBER"				integer: Length of the text string to be generated. "CHAR_MIN_SIZE"				integer: Minimum size for a char in the captcha. "CHAR_MAX_SIZE"				integer: Maximum size for a char in the captcha. "CHAR_MAX_ROTATION"			integer: The maximum degrees a Char should be rotated. Set it to 30 means a random rotation between -30 and 30. "CASE_SENSITIVE"			bool: If true the private key is case-sensitive. "MAX_TRIES"				integer: Maximum input attempts before considering it an attack. Infinite attempts with MAX_TRIES=0. "SESSION_INFO_LEN"			integer: The length of the session info string. "SECRET_POS"				integer[1, SESSION_INFO_LEN]: Position in a 32 length string where the session tries are stored (must be less or equal to SESSION_INFO_LEN). "SECRET_PHRASE"				string: A "secret" string to generate the md5 hash key. "NOISE_ENABLED"				bool: If enabled captcha will be rendered with background noise, if not then just with a grid. "NOISE_FACTOR"				integer: Background noise factor. "LANGUAGE_FILE"				string: Absolute or relative path to the language file to be used for the text outputs. "FORM_METHOD"				string[POST|GET]: The method the form is using to send the data. "REFRESH_ENABLED"			bool: If enabled the user can requesta a captcha regeneration without modifying the try count. "ONLY_MD5"				bool: If true it uses only the md5 function for encoding. "WEB_SAFE_COLORS"			bool: If true the image will only use web safe colors. "JPEG_QUALITY"				integer: Quality to be used for JPEG output image. "XAJAX_INC_FILES"			mixed[array(strings)|string]: The relative paths to the include files for xajax. "XAJAX_JS_PATH"				string: Absolute or relative path to the Xajax JS core file. "XAJAX_DEBUG_ENABLED"			bool: If true then Xajax debug is enabled. "GC_ENABLED"				bool: If true the GC is enabled. "GC_IDLE_COUNT"				integer: Number of captchas to generate before calling GC. "GC_CAPTCHA_PERIOD"			integer: Captcha alive period in seconds before GC collects it. Tom 7 has created very nice TrueType-Fonts. They are not under (L)GPL, but also free. Please read his License. Thank you Tom!